(SPOILERS) James Wan was quite busy last year, what with having two fright flicks released and crossing over to the action genre to begin shooting Fast & Furious 7 (only recently completed due to Paul Walker’s untimely demise). That he made two horror pictures in a fairly short space of time (this and The Conjuring) speaks volumes about his precise, methodical approach. 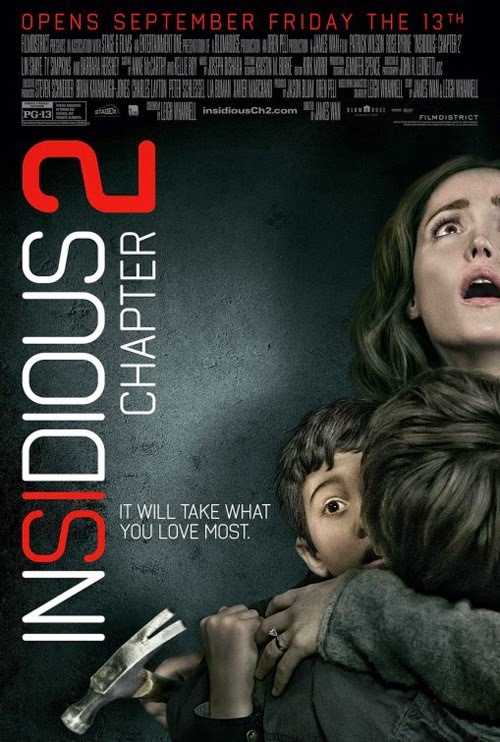 Insidious: Chapter 2 is a well made but cookie cutter affair, so formulaic and calculated it’s difficult to get remotely worked up by it’s made-to-order shock tactics. Everyone’s back, pretty much, including at least one dead person (Lin Shaye as paranormal investigator Elise Rainier) and events pick up directly after the first instalment, with Lorraine (Rose Byrne) being interviewed by police about Elise’s murder. If that scene looks as if it might send the picture in a less obvious direction (law enforcement and spooks), it proves not to be. It’s clear that Josh (Patrick Wilson) is under suspicion, not just from the police but also from Lorraine. But Wan and screenwriter (also playing nerdy investigator Specs) Leigh Whannell promptly drop what could be an interesting tack. The police investigations rule out Josh (somehow, the marks on the corpse don’t match Josh’s hands) and Lorraine enters a state of self-denial about what has happened to her hubby. Both developments are disappointing; the pushing of the police to the periphery stains credulity, while Byrne is very badly served with a character who spends most of the movie wandering about her mother-in-law’s house all on edge and not seeing the bleeding obvious. Most of the Lambert family plot is treading water while investigators Specs and Tucker (Angus Sampson), now accompanied by old friend of Elise Carl (Steve Coulter), trace the background of whatever it is that has been haunting Josh. Wan and Whannell dig deep into their bag of tricks, which include Dutch angles, repeated (and increasingly tiresome) instances of characters not seeing what another character sees (the old “There’s someone standing behind you” line), variants on the same (oblivious Dalton – Ty Simpkins – doesn’t realise he is not talking to his brother down the tin can telephone, even though its blatantly obvious to us), quiet punctuated by sudden noise, nursery rhymes used to sinister effect, children’s toys (this time a play walker) turning themselves off and moving of their own accord. Horror movies work to a great extent on the basis of tried-and-tested scares and devices, but they don’t have to be quite so relentlessly blatant and undemanding. The picture has Josh being super sinister and slowly decomposing (“Your dead soul is killing his living skin”) and Lorraine terribly useless, until eventually the investigators show up. There is an occasional nice idea, in amongst the clockwork plotting. The opening scene is set in 1986, and places a mystery (who is young Josh speaking to on the video playback) that has an effective WTF? pay off. The ability of Josh to time travel in The Further is just about the only interesting aspect of this other realm, which Wan seems to recognise has limited shelf life; he doesn’t spend nearly as long there this time out. Discovering that the haunter is your common-or-garden serial killer with a Norman Bates mommy fixation is distinctly underwhelming (mommy bears a passing resemblance to the operatic one from Shakespear's Sister, but with Siobhan's make-up). Naturally, there are bodies stacked up in a hidden room. It isn’t clear why the mother of Parker Crane (the killer) should lead them to her son’s house, masquerading as the non-corporeal Eloise. Apart from to give Wan an obvious but effective reveal (“I’m not who you thought I was”; see also the telephone cans above), that is. The device of shaking word-dice to communicate with the dead is quite neat, however, even if it leads to some rather daft scenes (“What is Parker Crane holding behind his back?”; er, now let me take a wild guess). In fact, much of the third act is rather awkward. The Further must be visited, and it’s nice to see Eloise again, but the threat in the corporeal house is rote, as Josh goes all Jack Torrance on his family. It makes no sense that he wouldn’t kill Carl, Specs and Tucker as he’s intent on murdering his own family. I guess it means the trio of investigators can return for Chapter 3, however. Which is out next year, sans the Lambert family (it’s slightly surprising that, after all this hassle, their arch nemesis can be despatched by beating her with a chair), and has Whannell making his directorial debut. He’s writing again, of course, which means there will be lousy lines like Josh’s, as he discusses how good it is to feel pain again; “I miss it, but not as much as I miss inflicting it on others”. Whannell isn’t going to win a Best Original Screenplay Oscar any time soon.